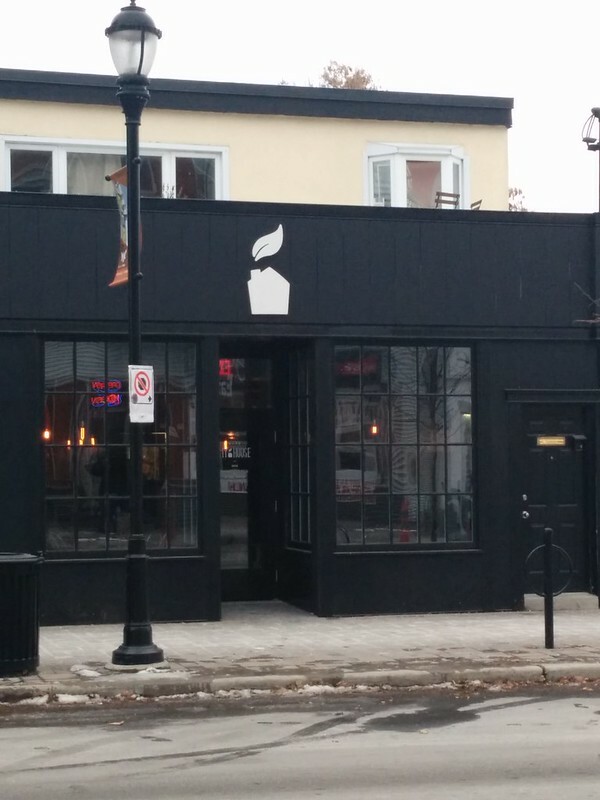 Ottawa – Day one – Cafe My House – vegan in your city. Last weekend we drove into Ottawa for the weekend so JC could play in a Magic the Gathering competition, and so I could wander around the nation’s capital and hopefully find a stamp museum. I haven’t been back to Ottawa for nearly a decade, but it’s still one of my favourite places. At least it has been one of my favourite places in theory for years, but despite living a mere 5 hours away in Toronto these days, it’s still the first time I’ve visited. First of all, I have to first mention the lovely time we had at the Marriott in downtown Ottawa on Kent Street. I feel as though my negative hotel experiences, even in places that should be nice, outweigh my positive ones, that it’s worth mentioning. Their web ordering was straightforward, I asked for a feather-free room and got it without any issue, extra foam pillows were brought up, service was friendly and courteous, and the room was lovely. Not super huge or opulent, but just enough to keep us cozy and comfortable. As we were driving in, I asked folks on Instagram what they’d recommend for us to do or eat in Ottawa, and man, people are so helpful. I had looked at Happy Cow, and the National Capital Vegetarian Association site, but nothing compares to that personal touch of having a few recommendations thrown our way. That’s how we ended up at Cafe My House on our first night in Ottawa. Two recommendations plus already being curious about the place tipped the scales in their favour. And the totally plant-based thing was a major bonus. We drove over from our hotel, and found (free) parking around the corner, wandered around street construction, and approached the general vicinity of where our GPS had first said “you have reached your destination.” But there was nothing saying “Cafe My House” and it was a little dark, but as we walked up to the restaurant, it was pretty obvious – totally black exterior with a little white icon of a house with a leaf coming out like a chimney. So, you know, obviously cute. We started our dinner off with drinks – JC ordered The Lebowski, because it was a pumpkin spiced drink made with whiskey and cashew milk (why is it called The Lebowski?) and I stole a few sips and they were lovely and unique… but not nearly as unique as my Speakeasy Martini. Which was made with gin, vermouth, fennel & cardamom pickle brine, and had a spear of frozen picked (?) grapes in it. This wins the strong flavours blending together nicely contest. 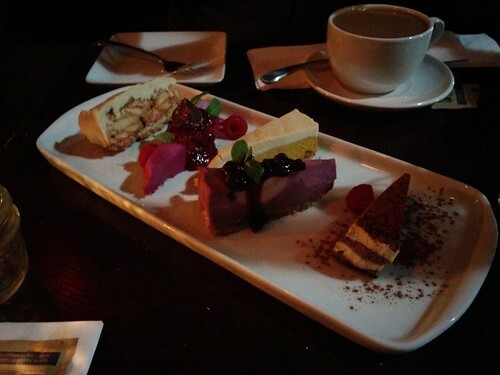 My eyes lingered on the cheese plate – but we ordered the 5-course tasting menu instead. 4 savoury courses and 1 sweet course that JC and I could share. I hadn’t picked up my new camera lens yet, so all of these pictures are from my phone, and some are too dark. First came the Kale and Roasted Hazelnut Salad. 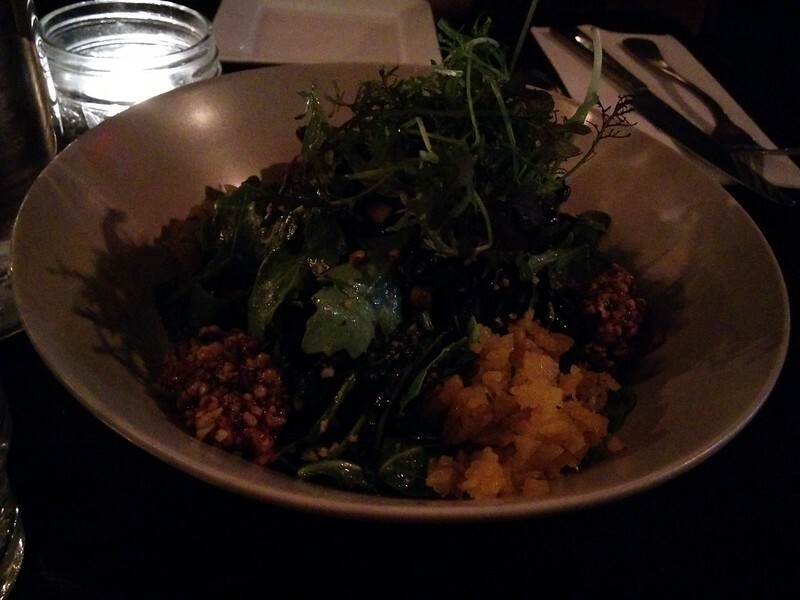 Some massaged kale and assorted greens, there were dollops of roasted hazelnut pesto and finely chopped golden beets. Salad isn’t usually all that exciting to me, especially at a restaurant, so when it came out as the first course I wasn’t surprised, but scrunched my nose at JC. But here all of the ingredients together were really fantastic. Next we had the amazing sesame crusted oyster mushrooms calamari. Caper based sauces are really appealing to me because of the strong flavours. JC and I have both eaten so many different versions of oyster mushroom fried, but this was a completely unique flavour and had a nice crisp texture without being the usual full tempura mushroom experience. Butternut Squash Cakes. Oh butternut squash cakes why can’t I take a box of you home to Toronto. These were delicious. 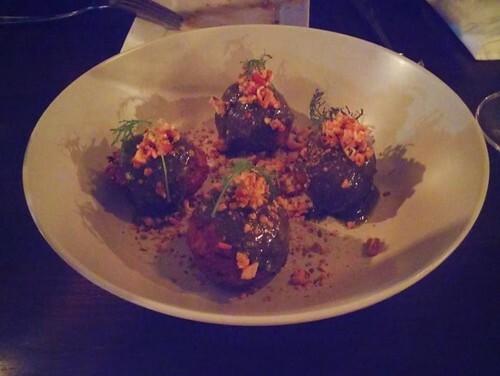 They were little round balls of butternut squash, and rice, topped with rosemary and pistachio pesto, and finely chopped roasted apple bits. Cinnamon seemed involved somewhere. Maple & Miso Roasted Brussels Sprouts. I want to like brussels sprouts, but I just don’t. JC does though. The crispy tempeh was my favourite part of the dish, especially paired with the coriander peanut sauce (though I wasn’t really conscious of the coriander flavour, it’s usually better not to be too aware of it anyway.) The mung bean sprout salad was a nice fresh light topping on an otherwise relatively heavy hearty dish. And finally a piece of black tea and espresso cake. With a cup of coffee. I don’t usually put anything in my coffee (with the exception of lattes) but it was nice they had both soy and almond milk to choose from. They get the coffee from Equator Coffee Roasters, a local Ottawa roaster (well sort of, they’re based in Almonte, Ontario) and then use a Hario pour over apparatus to make each individual cup. This coffee and this cake were so wonderful together. As for the items we didn’t try on our first visit? Well, we went back again the next day. Our server, and I believe also the manager, from the night before remembered us, and was training someone new. On a Saturday Night. This time around, the restaurant did fill up a bit, but it was still comfortable and friendly. 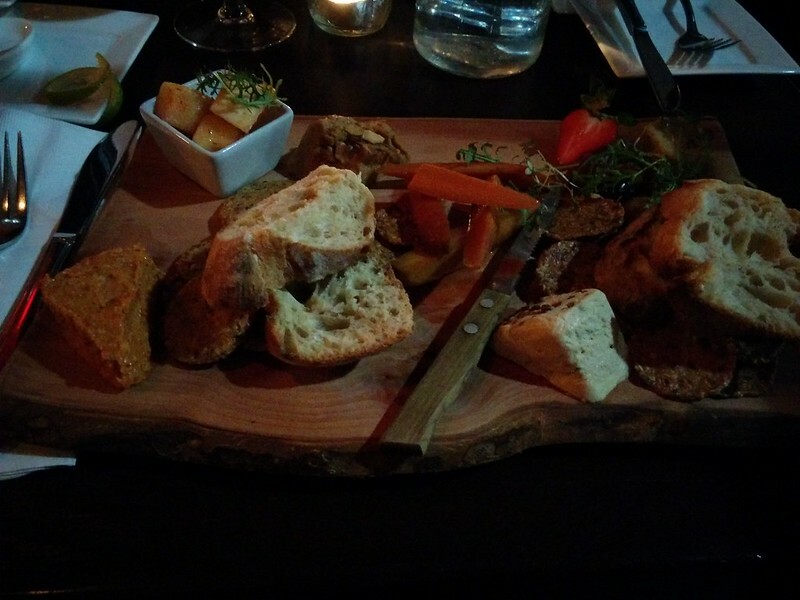 I really wanted to try their cheese board of assorted house made vegan cheeses. So we did! On this plate there are several soft and hard in house made cheeses – I know there was a spicy jalapeño cheddar, and smokey fake-on, and some others that I don’t remember. Assorted breads, and crackers, some pickled carrots and daikon. We also ordered the yam and sage gnocchi and the beet and brie terrine. The Yam and Sage Gnocchi were delicious with powerful flavours, and intriguing colours. 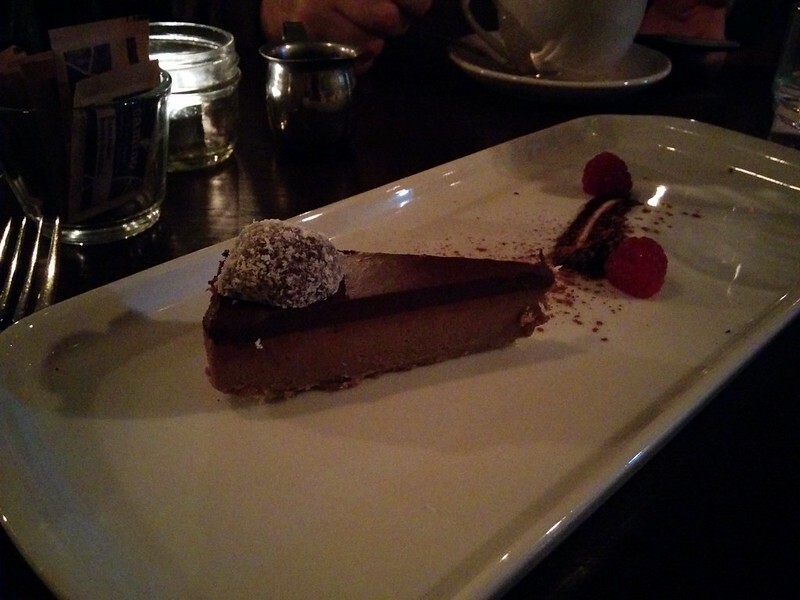 It was too dark to get a good shot of this dish which is too bad, because it was one of my favourites. The Beet & Brie was JC’s dish and was surprisingly cold, but that’s because I forgot what a terrine was (A terrine is traditionally a French forcemeat loaf similar to a pâté, made with more coarsely chopped ingredients. Terrines are usually served cold or at room temperature. 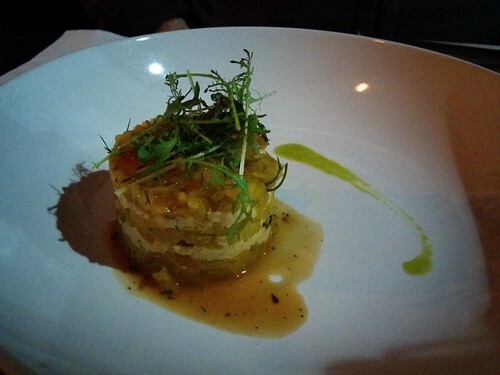 Wiki) It wasn’t my kind of dish, but was fresh and light with alternating layers of roughly chopped golden beets and their house made nut based vegan brie. We had a great time at Cafe My House, and will definitely be paying the restaurant a visit on future trips to Ottawa, especially since we went twice in three days. It’s just a great space, and a lovely experience. They have launched their new holiday menu and just celebrated 5 years in business. I’d recommend Cafe My House to anyone, but especially folks that like really fantastic beautifully presented food. Cafe My House, Vegan fine dining. Bookmark. Janet – it was such a nice experience!